The picture above was taken at the Cablevision studios in Peekskill, where I recently had an interesting, and fairly wide-ranging coversation with Assemblywoman Sandy Galef about the state of the New York State Legislature and judiciary, and the prospects for reform in New York generally on her television show "SpeakOut with Sandy Galef." I laid out some of the Brennan Center's latest thoughts on how we might get real changes in New York on campaign finance reform, legislative rules and redistricting. 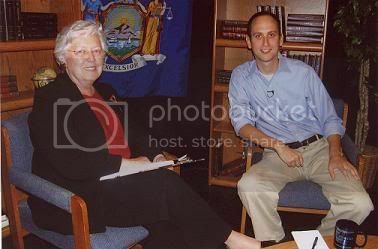 Sandy Galef has been one of the Legislature's leading reformers, and we discussed some of her efforts to make the legislature more effective over the last several years. The show will be airing for the next couple of weeks in northern Westchester and Putnam counties. We'll provide a link as soon as we get one. P.S. It is true that I'm wearing the same shirt in the photo above as the one at right -- pure coincidence! I do actually own more than one shirt.